Musical legend Prince died this month in 2016, and I thought as a tribute to this vegan genius, I’d do a piece on purple hued vegan recipes. 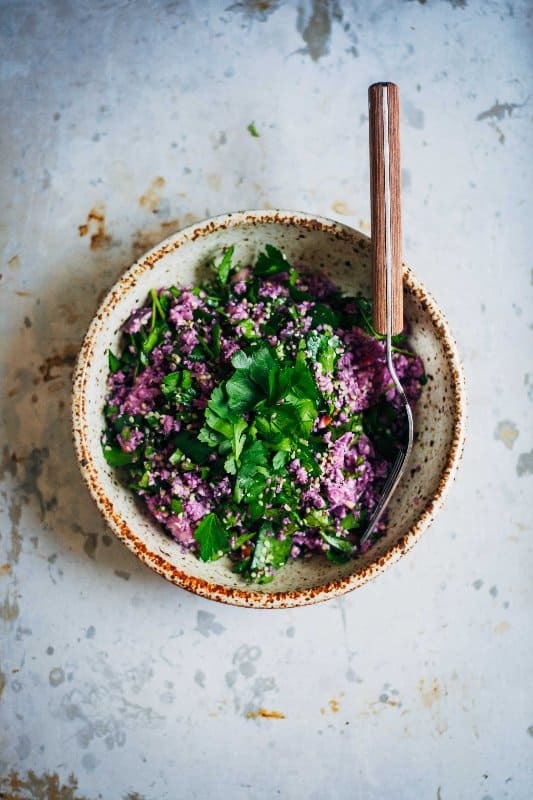 But that’s not the only reason to salute purple foods: this rich colour indicates the presence of some nutritional benefits, too. 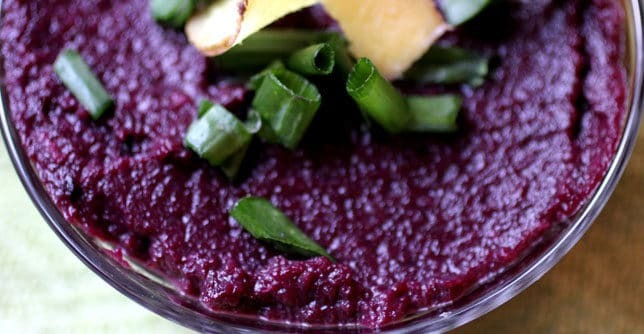 From the indigo hue of blueberries to the fuschia gloriousness of dragon fruit; from purple kale, carrots and sweet potatoes to purple asparagus and radishes, darkly coloured foods are packed with high antioxidant levels thanks to anthocyanin, the pigment that appears in blue, red and purple fruits and veggies. Antioxidants work pretty hard to prevent the oxidation of molecules in our bodies, which is a good thing, because once molecules oxidize, they can create free-radicals. Free radicals, to put it in layman’s terms, are right little punks. 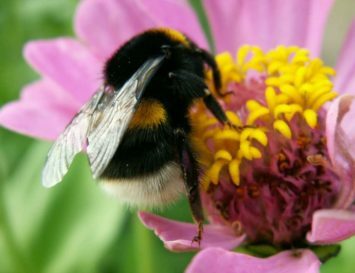 They basically enter the body and start causing havoc, turning even the nicest of cells in our body into delinquents. Free radicals go on a rampage and attack the healthy cells in our body in an attempt to stabilize themselves. The once-healthy cells then react by attacking other healthy cells in a destructive cycle that leaves us with a mass of free radical waste that weaken our organs, tissues and even our skin. Antioxidants are varied, and therefore different types prove beneficial to various parts of the body. For example, beta-carotene (found in foods such as carrots, sweet potatoes and leafy greens like spinach and kale) are vital for maintaining eye health. Lycopene (found in foods such as watermelon, sun-dried tomatoes and papaya) is beneficial in helping to maintain prostate health. Flavonoids (found in foods such as blueberries, romaine lettuce, garbanzo beans, strawberries and celery) are great for a healthy heart and finally proanthocyanidins (found in food such as blueberries, cranberries, black currants and pistachios) are great for a healthy urinary tract. 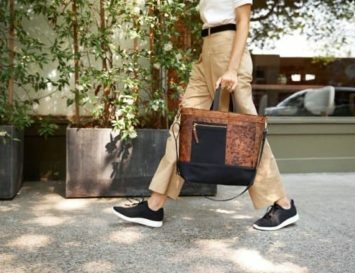 Increasing your intake of antioxidants with go far in protecting your body, especially when living in today’s heavily polluted, free-radical rife world. 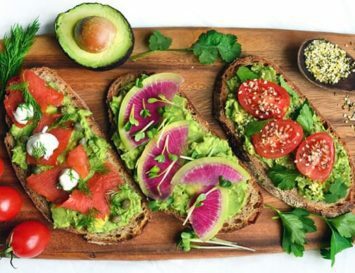 The vitamins, minerals, phytochemicals and enzymes within antioxidant rich foods will go toward helping with heart problems, memory problems, mood disorders and even immune system problems. Prince would have been impressed. Granted, this may sound pretty far from a peanut butter and banana smoothie, but life is all about trying new and wonderful recipes, right? Right! 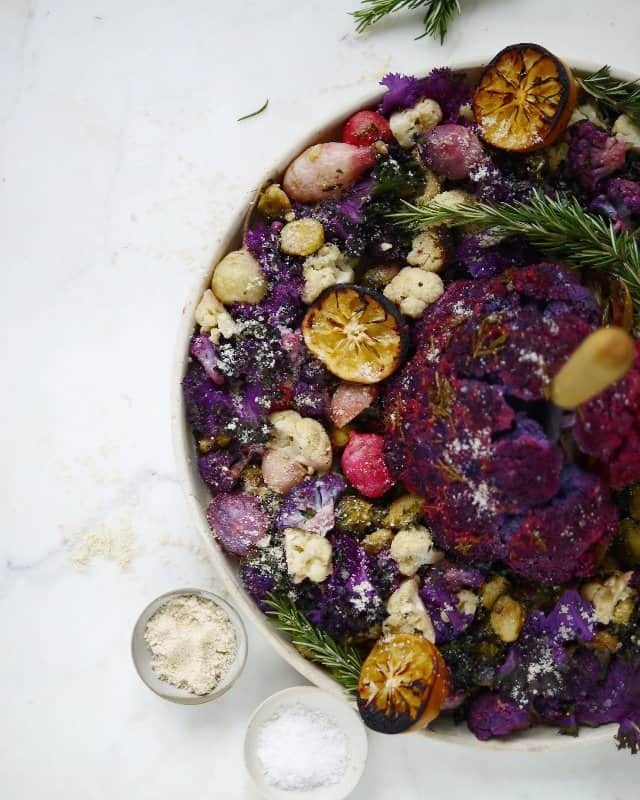 Plus, with cabbage’s high antioxidant levels as well as anti-inflammatory properties, it’s great for the skin and has vitamins A, C and K. Plus, did I mention it’s purple?! Smoothies are a lot more filling than juices, simply because you can fill them with fruits that you can’t necessarily juice, such as bananas, making them the perfect, filling breakfast choice. 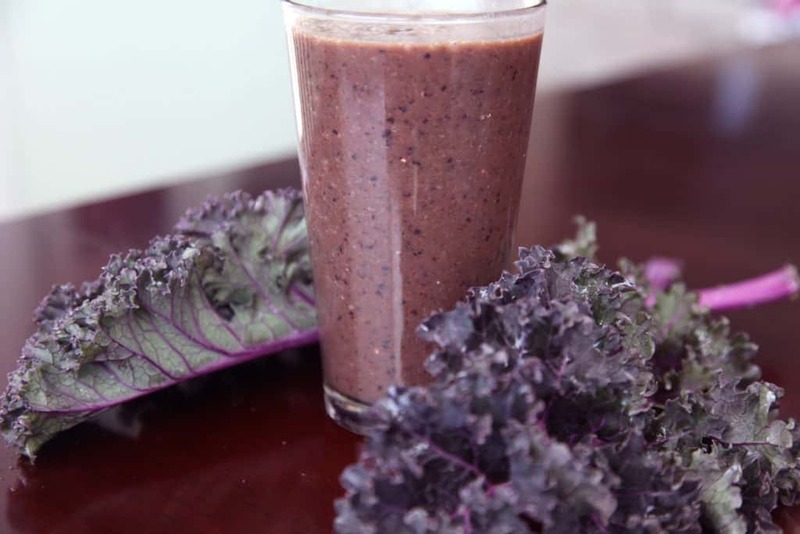 The purple in this smoothie comes from both acai, blueberries and purple kale whilst the banana will lends a creaminess and chia seeds will bulk it out further. I love smoothie bowls, simply because I love to eat my food rather than drink it. Acai is such a wonderful antioxidant to eat first thing in the morning, and this superfood will give you a great start to the day. 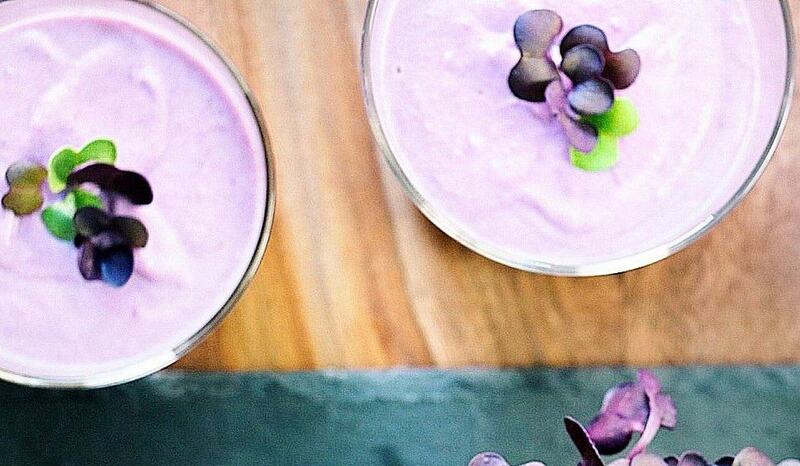 But acai isn’t the only purple fruit in this smoothie bowl, there’s some blueberries, too. 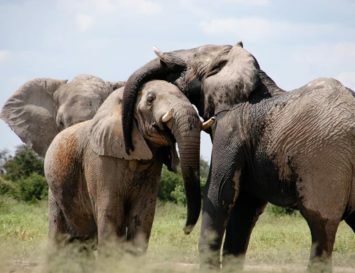 Double impact! I love making overnight oats simply because some days, I feel lazy as heck and the last thing I want to be doing is getting out various pots and pans when I can barely open my eyes. On days like that, it’s so great to be able to reach into the fridge and pull out an already made breakfast. 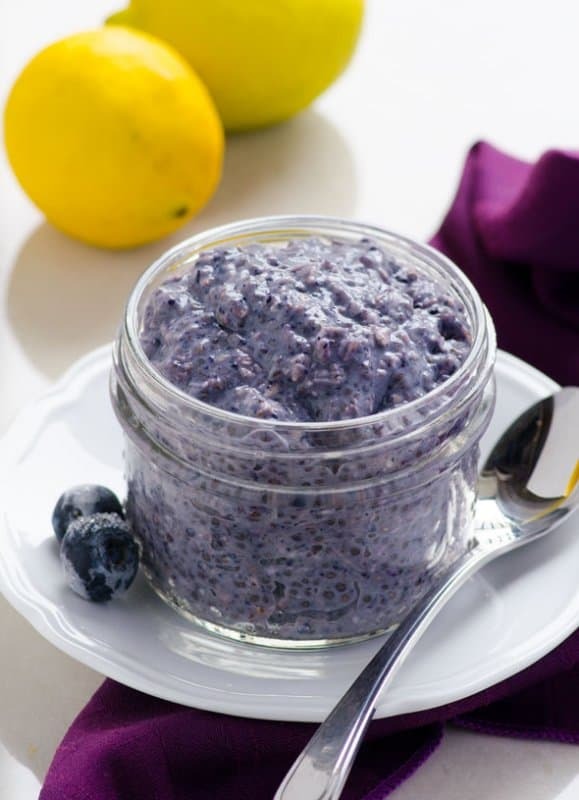 And this overnight oat recipe is refreshing thanks to the lemon, which also works nicely with those blueberries. Another overnight oats recipe, but this one is a little different. 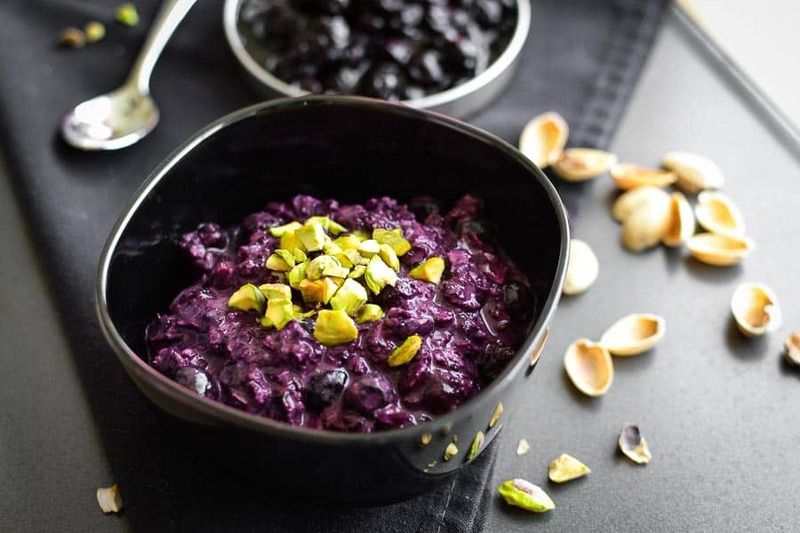 This recipe still uses blueberries for that wonderful colour but they’re mixed with some vanilla for sweetness and then topped with crushed pistachios. There’s also a delicious blueberry compote recipe that goes along with this that you can even use as a jam spread. 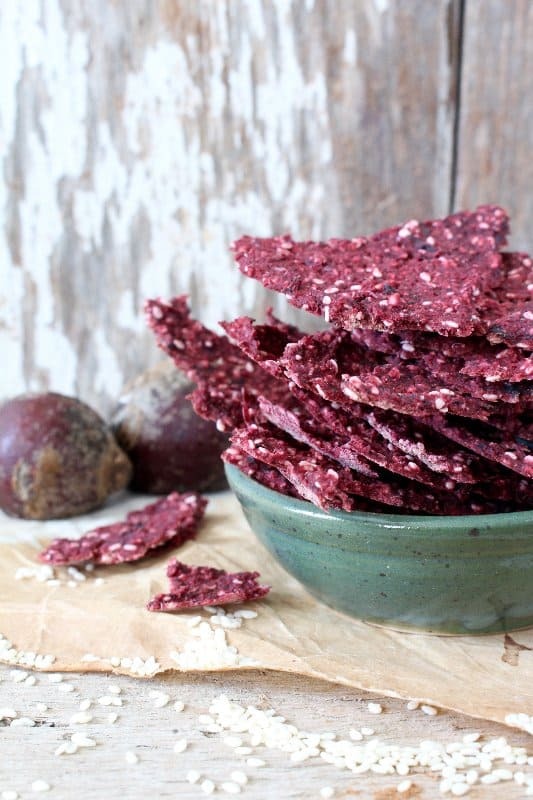 I love having a cracker recipe on hand because sometimes finding healthy and vegan friendly crackers is a bit of a mission. Plus these also contain seaweed, another food that is tipped to be super popular during 2017, and for good reason: it’s a brilliant source of both magnesium and B12! Enjoy these crackers crumbled into soup or use them as dippers for hummus. 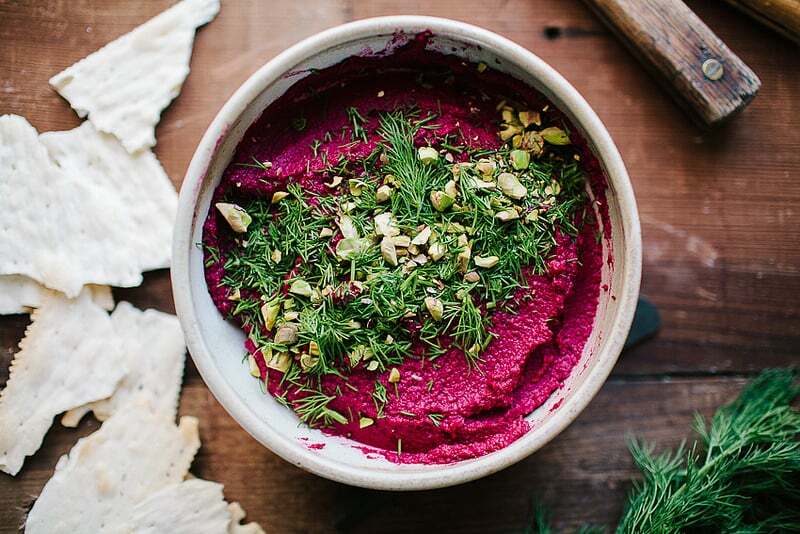 Speaking of hummus to go with those crackers above, here is a yummy, vibrant looking recipe made from – you guessed it – beetroot! But there’s a slight smoky edge to this dish thanks to the addition of paprika. This is served with fresh dill, chopped pistachios and feta cheese but to keep it vegan simply omit the cheese – it’s really too rich anyway, if you ask me. If tabbouleh could ever be deemed cute, then that is what I would refer to this dish as being. I’d throw in lots of other veggies with this dish, such as avocado chunks, picked red onion (see above) and some roasted sweet potatoes. This Asian themed noodle salad is high in protein and it just so happens to be gluten free, too. 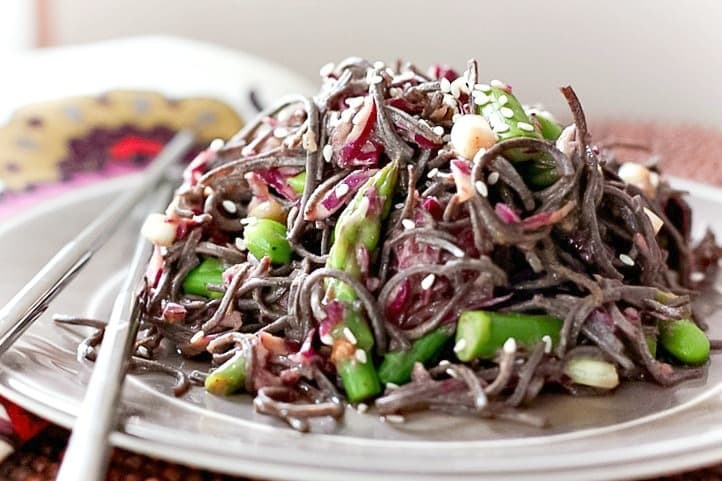 The black bean noodles give this dish the perfect texture against the almond butter vinaigrette; no sloppy, soggy noodles here! And you should all know be now that this will still be delicious the next day if there are any leftovers. Which there won’t be. When we think of tacos, we tend to imagine corn shells, but given the fact that much corn is GMO, it’s best avoided. 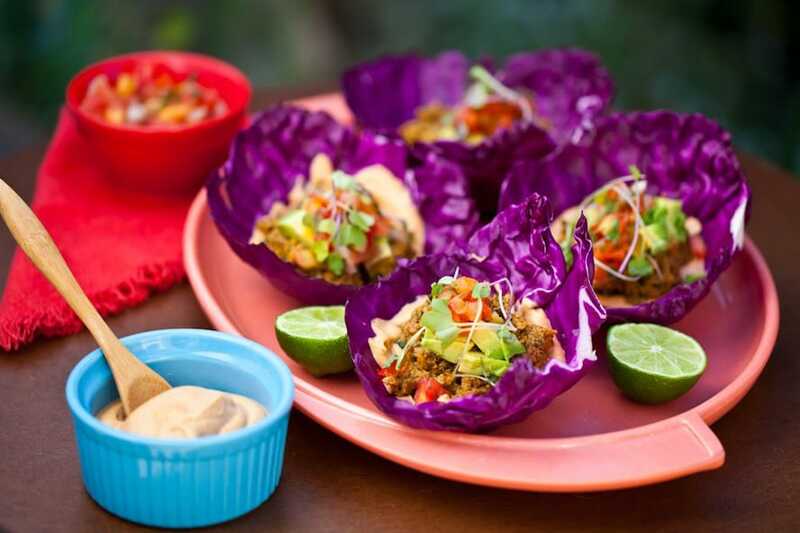 This is a really light take on a popular Mexican dish – the purple cabbage base gives a deliciously crunchy exterior, and they’re filled with an assortment of flavours: the walnut taco ‘meat’ mix, topped off with a raw chipotle cashew cream. I can’t wait to give these a go, those colours are amazing! We all love soup, right? And what’s not to love. It’s easy to make, it tastes great and it’s still delicious and wholesome if we’re in a rush and limited for time. This recipe does call for butter to sweat the scallions, shallots and ginger, but if you can’t find a vegan butter I’d recommend using coconut oil. It will add a delicate sweetness to the soup. Sometimes we just want a simple salad – but one that looks great and tastes even better. Well, check! There’s a great crunch to this from the red cabbage and a delicate softness from the creamy ripened avocado. Cherry tomatoes add a little sweetness whilst the lime dressing with the fresh coriander adds a freshness. Whoever said salads were boring?! Be honest. 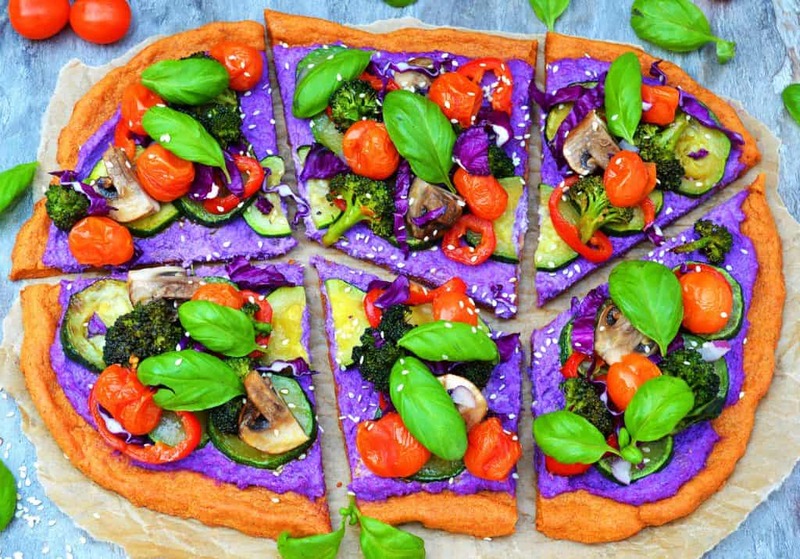 Have you ever seen a pizza look so wonderfully and colour and still be healthy and good for you?! The colours on this pizza are incredible, and they just go to show how delicious and vibrant a plant-based diet can be. The base here it made from quinoa, a great grain to bake with. 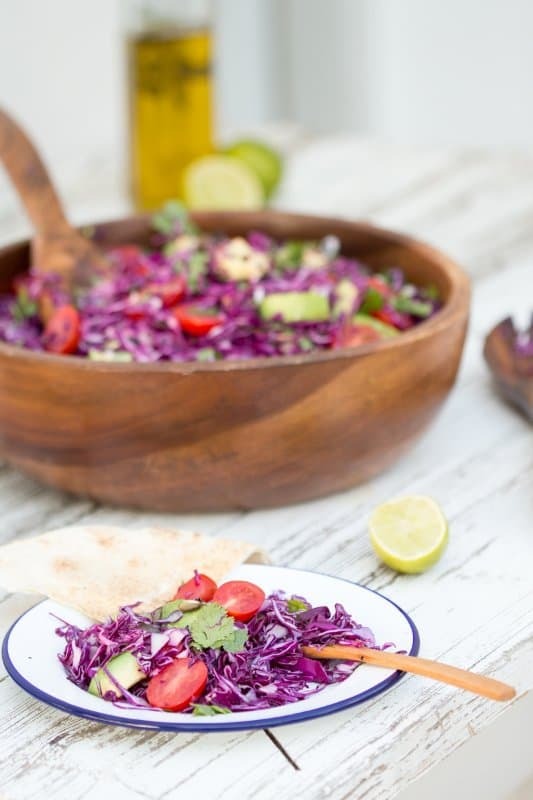 A cashew and red cabbage sauce is used and then it’s topped with an abundance of veggies. 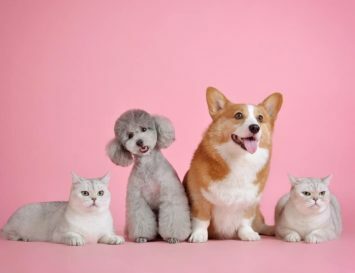 Feel free to pick and choose whichever ones you love. If you grew up in my household you’d probably think that cauliflower was this mushy, bland veg (sorry, mum) so prepare to have this changed. When roasted, cauliflower gains this incredible texture. It’s tough on the outside and yet soft and chewy on the inside, so it kind of replicated a meat-life texture, making it the perfect main in a dish like this. If your kids didn’t like vegan mac and cheese before, they certainly will now that it looks like it’s come straight from the pages of a fairy tale. The mac and cheese sauce is made from cashews, potatoes and carrots and becomes so, so creamy. 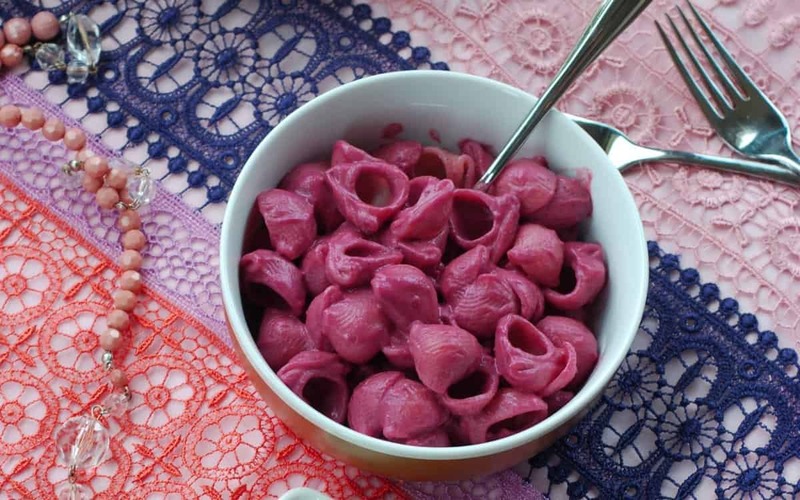 Throw in some purple potatoes, purple carrots and who the hell, some beetroot and you’ll still have a stunning mac and cheese. It’ll just like hella cute! Sometimes we just need to bite into a delicious burger! Obviously one that’s vegan though, because dead animals, eww. Well the red in this burger is for a great reason – beets! 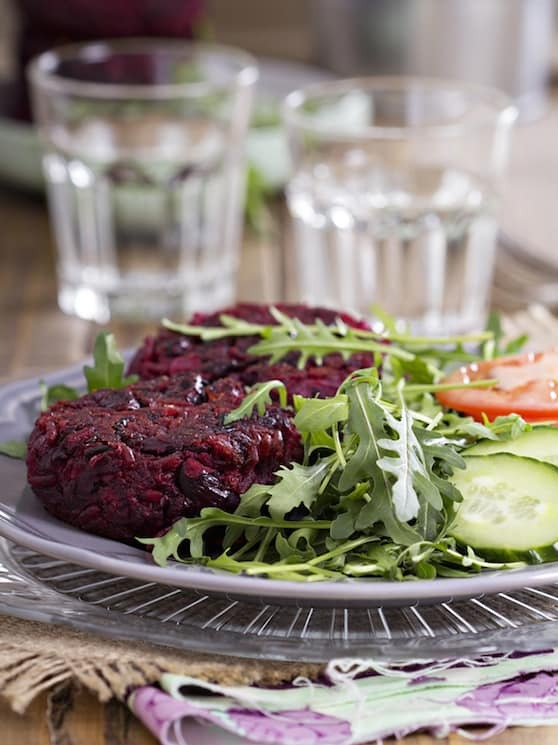 You can either enjoy these beetroot burgers on their own with a leafy green salad or pack them into a bun and go wild. 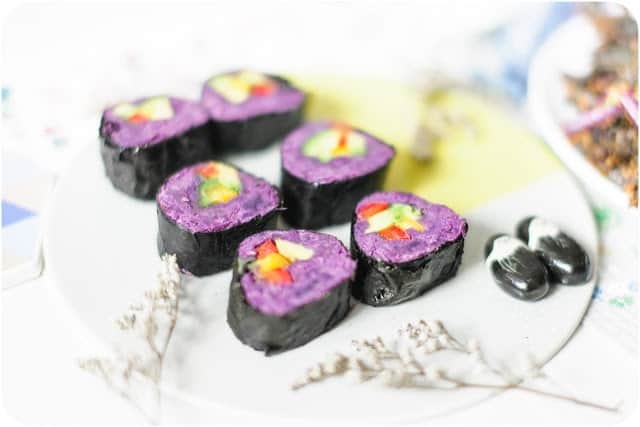 We’re accustomed to making sushi with rice, but why not try these sweet potato sushi rolls? We all know how hard it can sometimes be to make sushi when the rice is rolling everywhere and we give up before we can make a perfect roll. Well, these are so easy to make and they also come with a tasty, tangy dipping sauce. 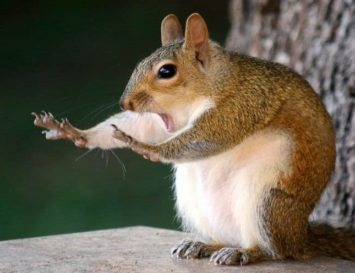 Now to go dust off your chopsticks. The yams in this recipe are sliced into really thin fries and then baked until they’re crispy. Then they are seasoned with a little bit of salt and maple syrup which gives such a delightful sweet and savory mash up. Bet you want some right now….right? 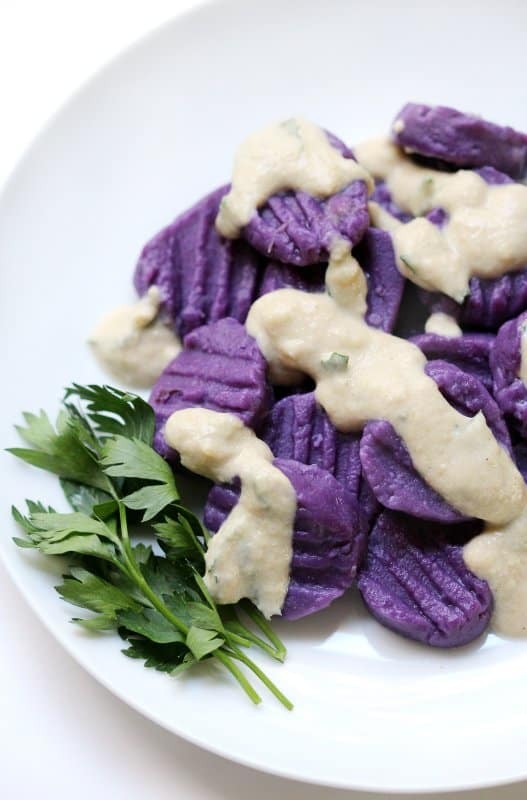 Gnocchi is such a yummy food, especially when it comes with a gorgeous sauce like this tahini and parsley sauce. 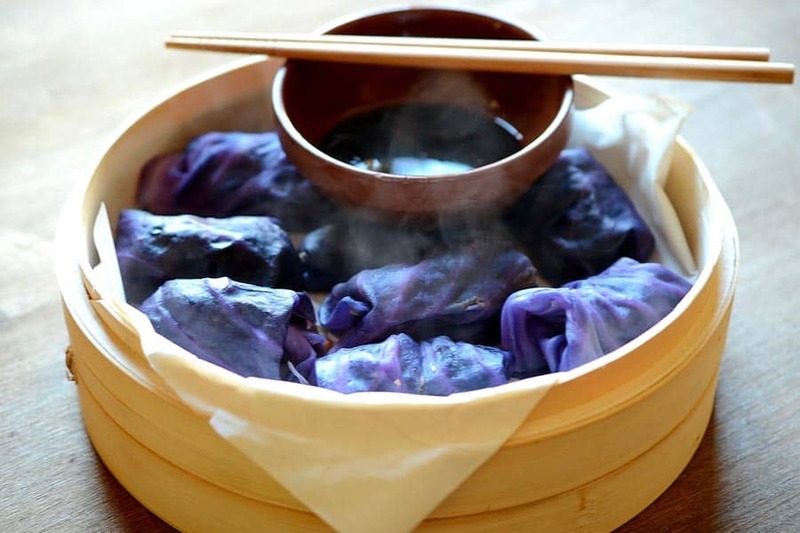 These little doughy soft dumplings are ever so delicately sweet as they’re made from purple yams. Just a heads up – you may have to convince your children this is real food and not Play-Doh ;). Dumplings are one of my favourite foods, as they remind me of my time spent in Hong Kong. The purple cabbage in this looks so vibrant. Serve these up in a bamboo steaming basket with little dishes of soy sauce for dipping they look pretty professional. Brownie points to you if you’re hosting a dinner party. 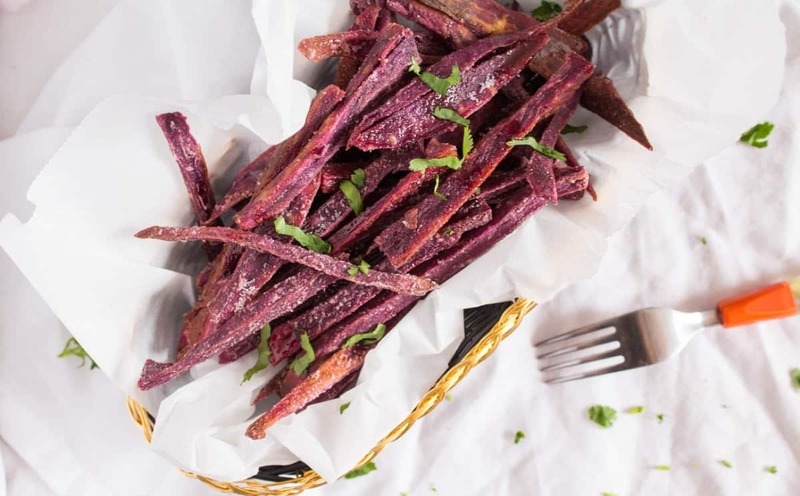 When it comes to purple foods this year, don’t think it only stops at salads and potato wedges. 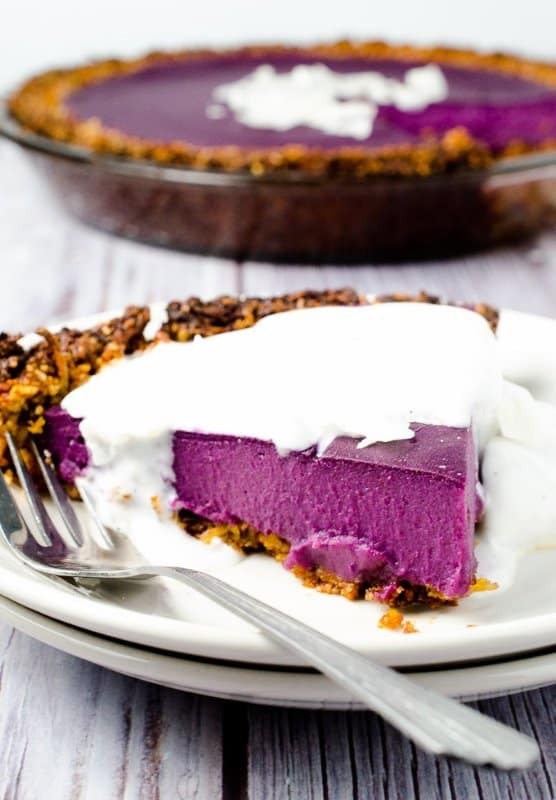 Purple desserts are a thing, too. These mousse desserts require zero baking, and are a refreshing shot of sweetness after a big dinner. Sweet potato brownies have been done to death, so this is a nice twist on the vegan favourite. 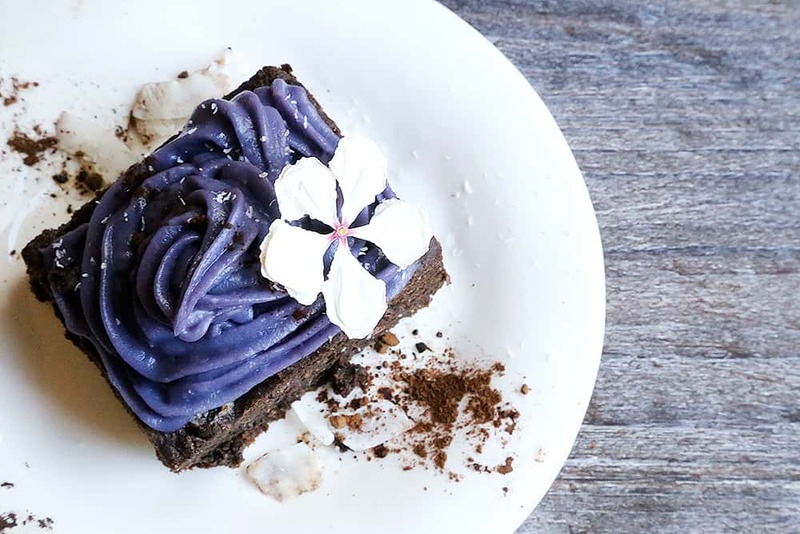 It’s a cake, not a brownie, and rather than being dirt coloured, it’s got a fairytale frosting of deep purple. I love me a donut but I love them even more when they’re healthy! 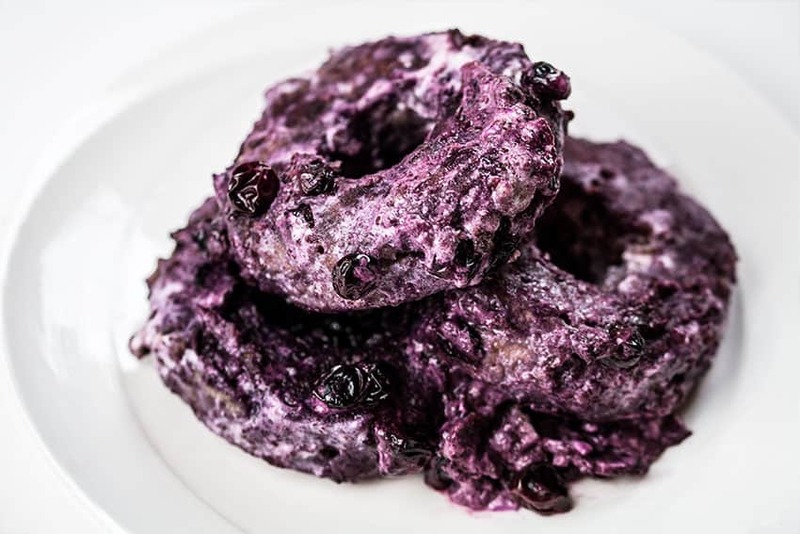 These purple donuts are filled with lots of goodness, as well as the fact they’re simmered in water and not baked or fried so they won’t be heavy and greasy. 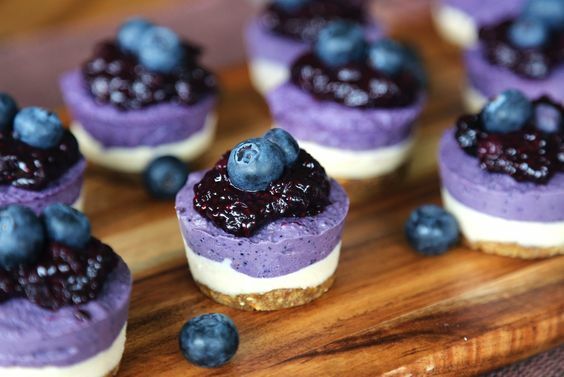 Plus they’re coated in blueberries and coconut yogurt, giving them a rippled perfect hue. Sweet potato pie is the bomb. Seriously, it’s SO good. And whilst it’s a weird concept to imagine using vegetables in a sweet pie dessert, southern Americans have been feasting on this recipe for decades. And let’s just take a second to appreciate that colour, wow! This recipe simply could not be easier. 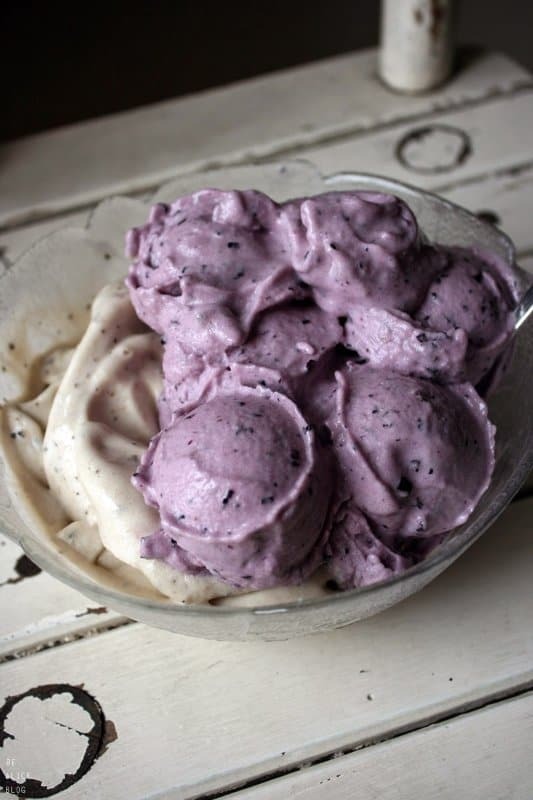 And there’s nothing quite like a clean, vegan ice cream after a meal on a hot summer’s day. The skin of purple grapes contains the same flavonoids as blueberries – great for your skin! These may look pretty decadent, but actually the ingredients list reads like a superfoods shopping list. And there are so many great anti-oxidants here, I’m contemplating giving up skin cream and eating one of these a day instead. So, we’ve had purple foods so it’s only right we finish this off with some purple drinks, right? 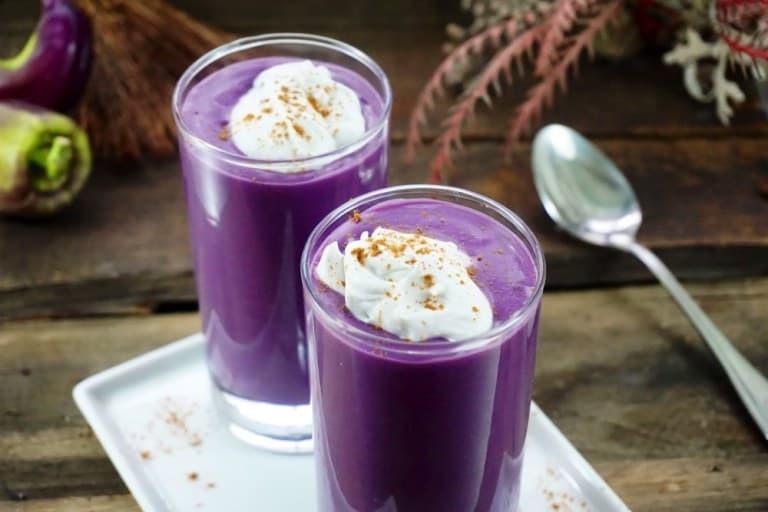 Purple yams are used to create this incredibly rich creamy latte, which is the most stunning shade of mauve. The jams add a wonderful texture, whilst the coconut makes it both creamy and decadent. I know what I’ll be sippin’ on tomorrow morning. 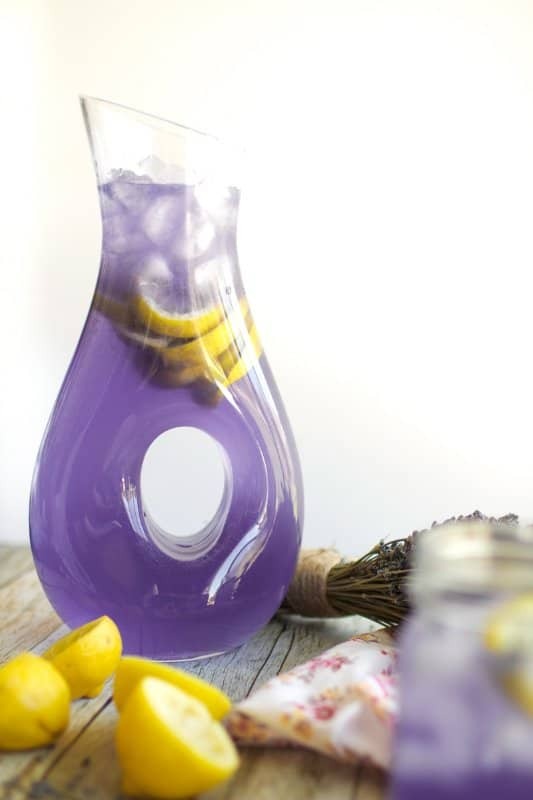 Oh gosh, how magical does this lavender lemonade look? It’s good for us, has many healing properties AND it packs n antioxidant boost. Plus, this recipe is far too pretty to leave out. 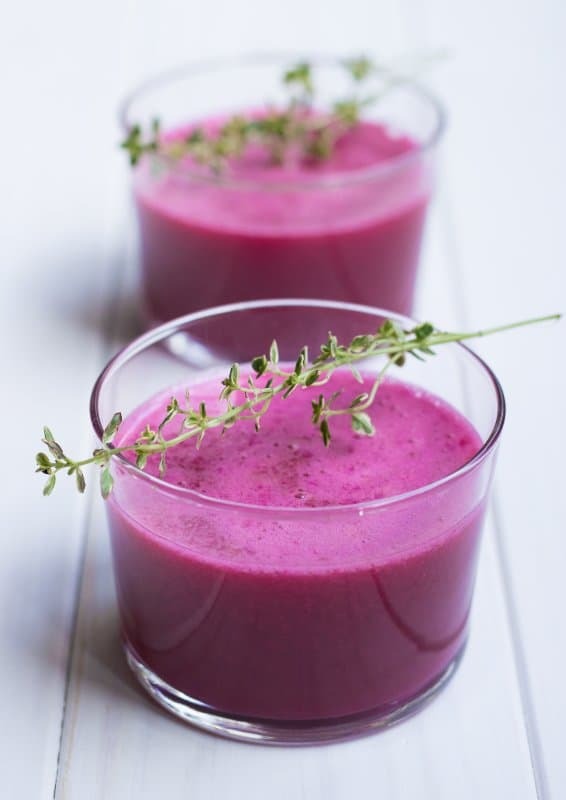 Imagine serving this up to friends when the sun is shining and you’re handing people refreshing glasses of this purple potion. 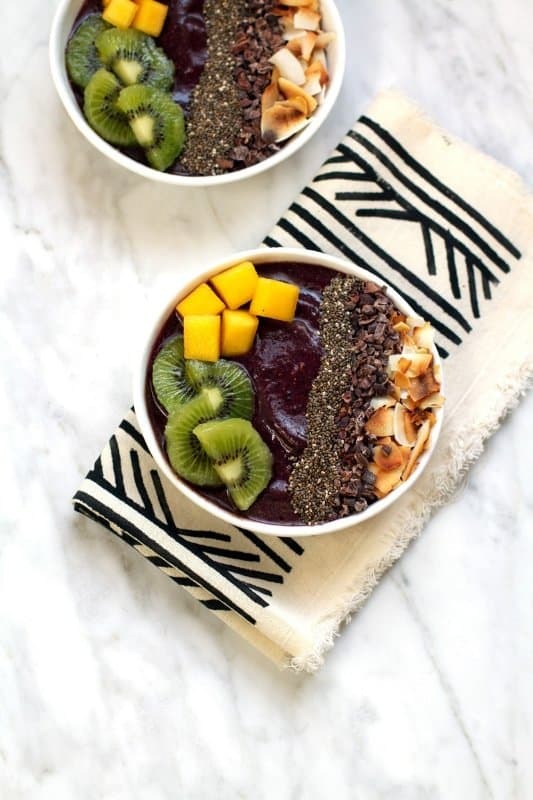 Main image: Acai Breakfast Bowl. Get the recipe here.